The park has been fenced-off since 2016. 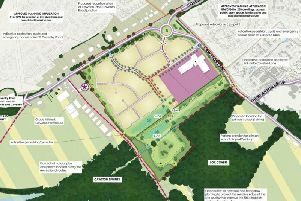 Rugby's planning committee has rejected plans to build a retirement village of 62 apartments and 14 bungalows on the town's much-loved Oakfield Recreation Ground. Council officers previously recommended that the application, fielded by developer McCarthy & Stone, should not be approved - and council officer Chris Kingham branded an argument the developers used as 'spurious'. New Bilton Labour Councillor Mike Brader, who spoke at the December 5 planning meeting to urge other councillors to reject the plan, said: "I'm delighted that this application has been rejected. "The argument put forward by the applicants that Oakfield cannot be classified as open space as it is now fenced off was rightly called 'spurious'. "The crucial point is that any development on Oakfield would mean an unacceptable loss of open space for our area, something which we are already lacking. I hope that the Co-Op, who own the land, will do the right thing now and work with the council to bring the park back into public use. "Myself and the local borough and county councillors for New Bilton will be doing everything we can to help make this happen." The decision comes after the extensive campaigning of residents' group Save Oakfield and objections from Rugby councillors. The Heart of England Cooperative Society, which owns the land, fenced-off the park to the public in 2016 when Rugby council rejected plans to build homes on the site. Rugby council has repeatedly offered to buy the land from the Co-op - all such offers have been rejected.